Even as an adult, I still feel sad about the bullying I experienced while at secondary school and hate how this is an issue which still isn’t taken seriously enough. 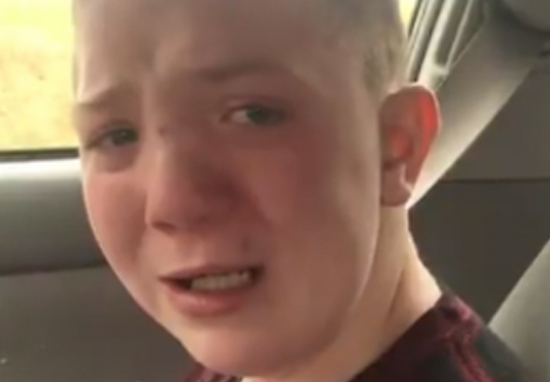 I therefore felt completely heartbroken after watching a video of school pupil Keaton Jones from Knoxville, Tennessee tearfully discuss the torment he’s received at the hands of his classmates. Nobody should have to experience such a brutal knock to their self-esteem – I know from experience how playground ‘teasing’ can ruin your confidence and deeply affect the way you view yourself, long into adulthood. Keaton’s mum, Kimberly Jones, uploaded the video to Facebook and it appears many other people were deeply moved by the young boy’s plight. For the record, Keaton asked to do this AFTER he had me pick him up AGAIN because he was afraid to go to lunch. My kids are by no stretch perfect & at home, he’s as all boy as they come, but by all accounts, he’s good at school. Talk to your kids. I’ve even had friends of mine tell me their kids were only nice to him to get him to mess with people. We all know how it feels to want to belong, but only a select few know how it really feels not to belong anywhere. The devastating video was viewed over 13 million times, with many people commenting to offer support to Keaton and Kimberly. 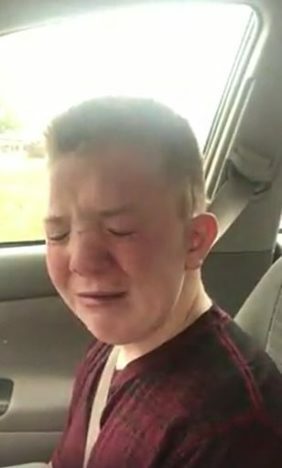 In the video, Keaton spoke out about how he was too frightened to go to lunch after cruel bullies ‘poured milk on him’ and shoved ‘ham down his clothes’. Heartbreakingly, Keaton says these attacks were on account of him ‘looking different’, with the bullies telling him he was ‘ugly’. Keaton cried as he revealed he had no friends, asking the question all too many of us have asked at this difficult age, ‘Why do they bully? What’s the joy in it’? Luckily, Keaton’s story has taken a positive turn – many of the people who watched Keaton’s video admired his strength and courage – noting how the young boy showed a maturity beyond his years. This included American football player, Tennessee Titans tight end, Delanie Walker – he stood up for Keaton in a supportive video and invited him and his family to come to a Titans game as his personal guests. Hopefully my video and the tweets that Keaton have been getting brings awareness to bullying and how serious it is in our school system. Hopefully, this will help shine a much needed spotlight on an issue which affects too many young and impressionable people. If you have been affected by this story or need to talk to someone in confidence call Childline free on 0800 1111.